Those pizza aficionados out there who import mineral water from Naples to make their pizza dough, look away now. This is as far away from an Italian style pizza as you can get – think more a piece of pie from Brooklyn, and it’s delicious. No scant toppings of wafer thin prosciutto and arugula here. This pizza is hearty. Don’t get me wrong, I’m very partial to a thin based pizza with minimal toppings of buffalo mozzarella and heirloom tomatoes but every now and then it’s nice to have something a little more gutsy. 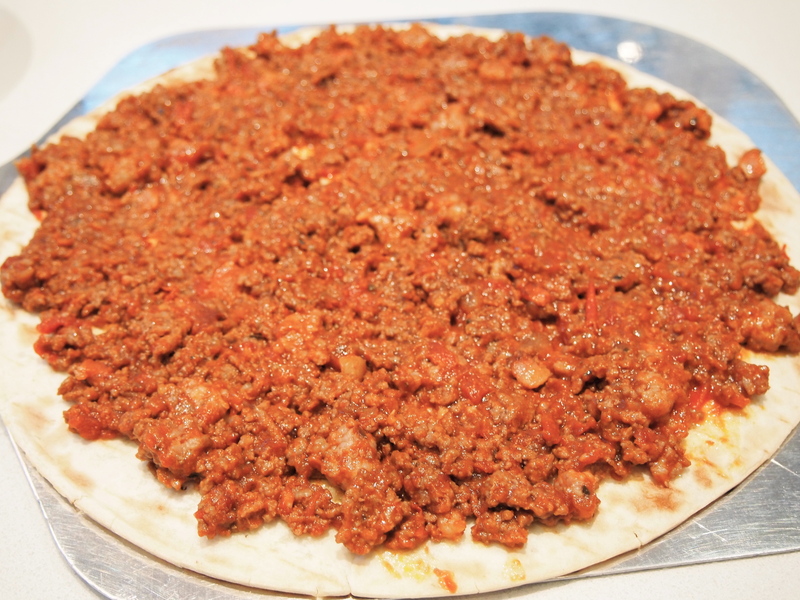 The name meat fest is due to the fact that the base of the pizza isn’t topped with the usual tomato sauce but a rich smoky bolognese style ragu made with minced beef and crumbled sausages; and if that wasn’t enough meat the pizza is then garnished with final layer of pepperoni. If I have the time and inclination I often make my own pizza dough (minus the imported mineral water) but I’ve recently found a store bought pizza base (Bazaar brand) that’s thin and can stand up to the toppings while remaining crisp which means I can decide to have pizza without too much planning ahead. If the weather’s good we grill this on the barbecue which gives it a wonderful wood oven flavour but it’s still awesome baked in a hot oven. To make the ragu heat some olive oil in a saucepan over medium heat and add the onions. Cook until onions are soft and translucent. Add the garlic and chilli flakes and cook for a few more minutes. 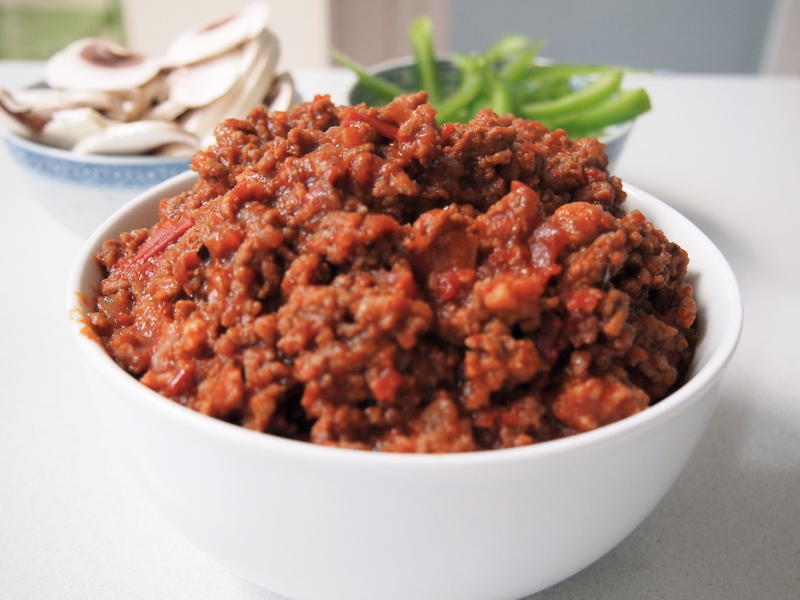 Increase the heat and add the minced beef and the sausages. Stir and cook, breaking up the meat with your spoon until the meat has changed colour and is starting to brown. Add the tomato paste and let it cook with the meat for a couple of minutes then add the diced tomatoes, sugar, oregano and barbecue sauce. Season with salt and pepper and bring to the boil. Lower the heat and simmer uncovered for at least 30 minutes or until the sauce is reduced and thickened. Let the sauce cool and set aside. Preheat oven to 220C (or if you ant to make it on the barbecue set up your grill for indirect heat). Take the pizza base and top it with enough ragu to give a nice thick even layer over the entire base, leaving a small border around the edge. 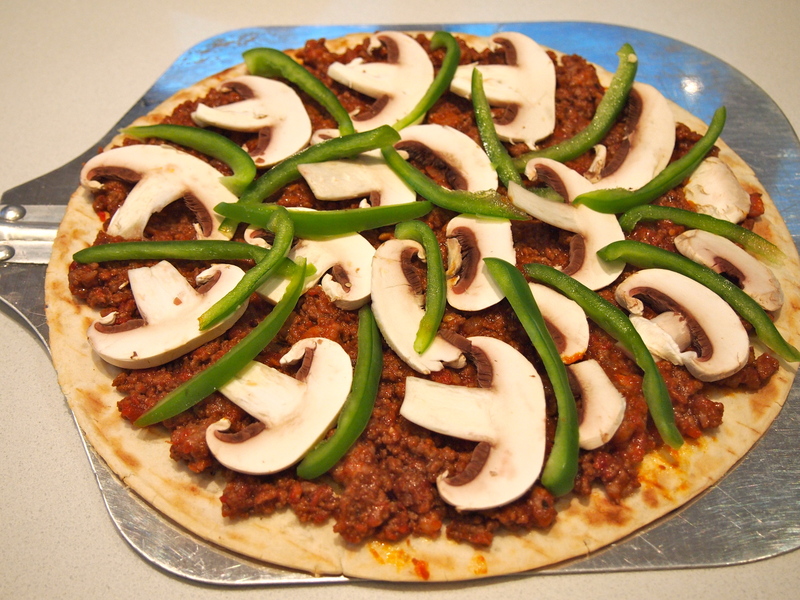 Add a layer of the sliced mushrooms followed by a layer of the sliced green pepper. 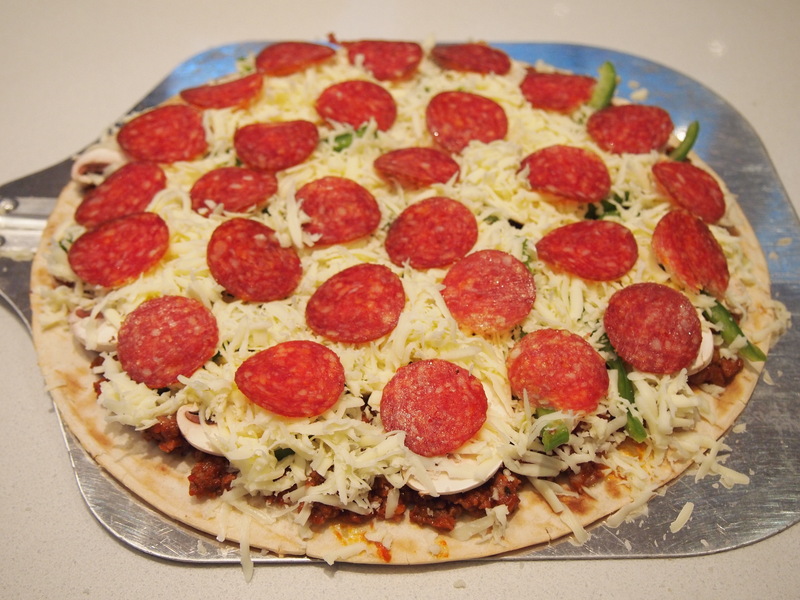 Add the mozzarella evenly over the pizza then add a final layer of pepperoni. 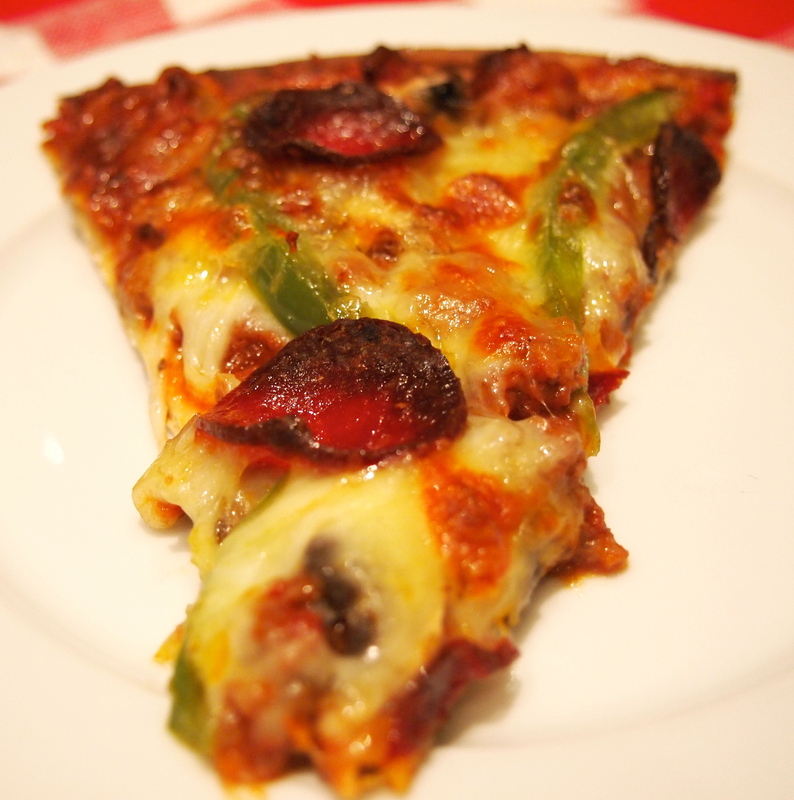 Place the pizza in the preheated oven for about 20 minutes until the cheese has melted and the top is golden brown. Check every 5 minutes to make sure it’s not burning and rotate it to cook evenly. 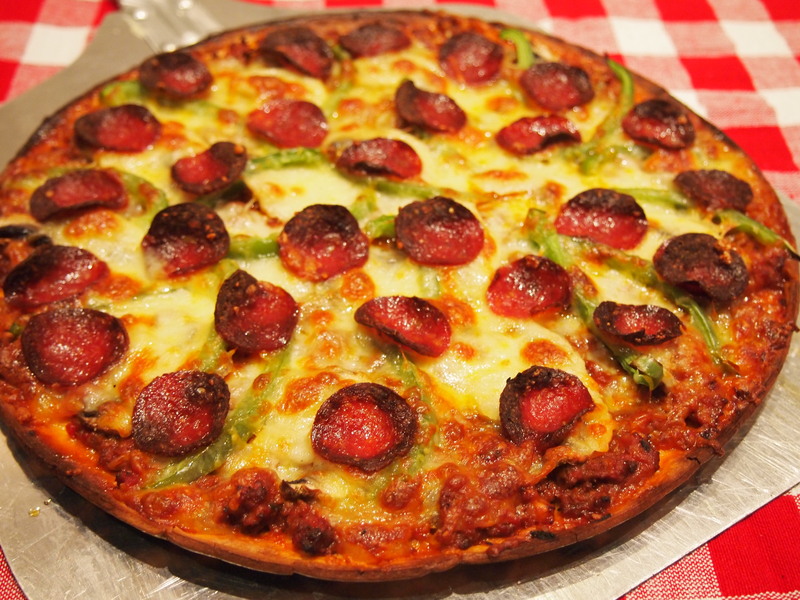 Alternatively place the pizza on the barbecue and cook for a couple of minutes with the pizza directly over the flame to crisp the base. Then move the pizza to the indirect part of the grill, lower the lid and cook for about 10 – 12 minutes or until the top is golden brown. Again you’ll need to open the lid, check on it and rotate it during the cooking time.